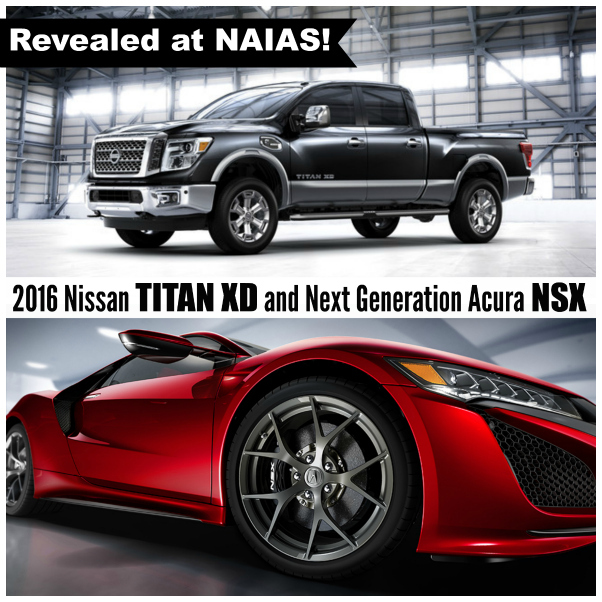 Revealed: The All-New 2016 Nissan Titan and Next Generation Acura NSX Supercar! What a thrilling time it was last week during the 2015 North American International Auto Show! Among the many exciting revelations, we were so pumped up seeing the 2016 Nissan Titan and next generation Acura NSX. You can relive the reveals of each model on the Acura news and Nissan news websites or watch the videos at the end of this post. We’ve rounded up a few details for you on each model, so check them out. The new Titan XD is the first of the new generation of Nissan Titan models. The new Titan was designed as a “powerful precision tool” with the concept of having a “work-place warrior” ready to haul, pull, tow and tackle, yet also is intended to deliver style and comfort for everyday use. 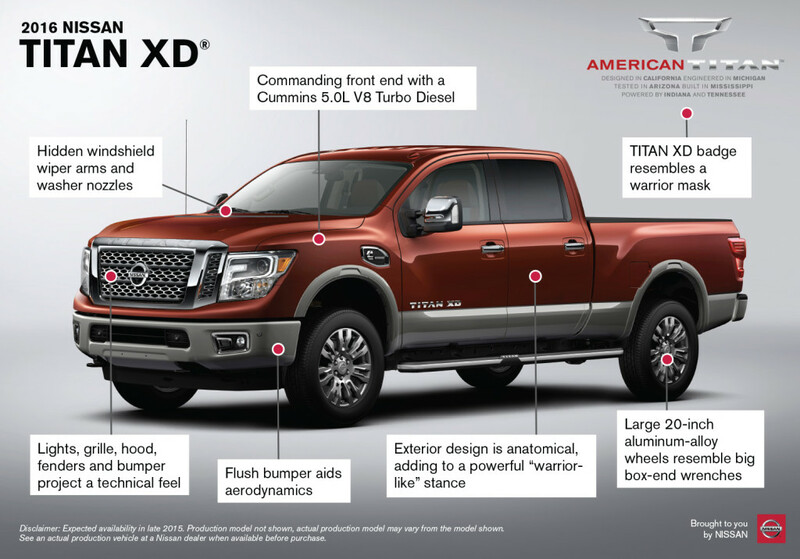 The Titan XD provides more effortless towing and hauling than its larger, more expensive heavy-duty competitor’s trucks – yet has the fuel-efficiency and affordability of half-ton pickups. Powered by a new Cummins 5.0L V8 Turbo Diesel rated at 310 horsepower and hefty 555 lb-ft of torque, the 2016 Titan XD will offer an available maximum towing capacity of more than 12,000 pounds (when properly equipped). Titan’s industry-first Utili-track™ Bed Channel System continues with the new design. Available exterior and interior convenience features on the all-new Titan include RearVew Monitor with Trailer Guides, Around View® Monitor (AVM) with Moving Object Detection (MOD) and a Trailer Light Check system that allows one-person hook-up operation – including checking turn signals, brake lights and running/clearance lights from outside the vehicle—Blind Spot Warning (BSW), front and rear sonar system, and front and rear NASA-inspired zero gravity seats. Along with the Titan Crew Cab shown in the Detroit preview, the new Titan will be available in King Cab and standard cab versions and with 4×4 and 4×2 drivetrains. Future engine options will include a new gasoline V8 and an advanced gasoline V6. 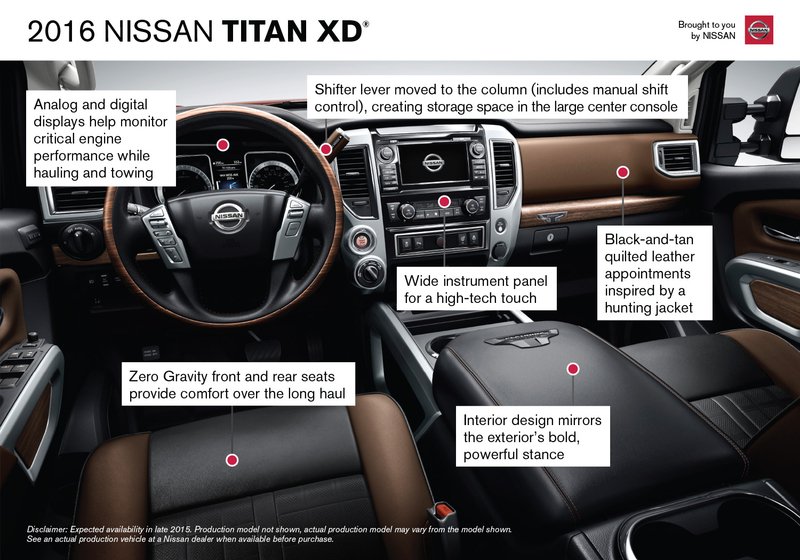 The Titan XD is projected to go on sale at Nissan dealers nationwide in late 2015. 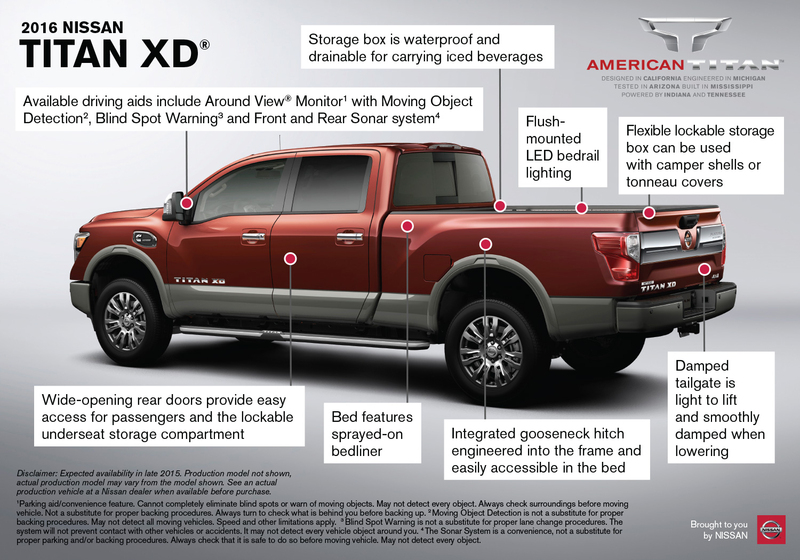 If you’re a truck-lover, be sure to check out the infographics below which highlight exterior and interior details of the 2016 Nissan Titan XD. The new NSX was specifically created to bring a “new sports experience” to the supercar segment. The NSX features an all-new power unit—a twin-turbocharged 75-degree DOHC V6 engine with a 9-speed dual clutch transmission (DCT) and three-electric motor Sport Hybrid system—integrated with an ultra-rigid and lightweight multi-material body with world’s-first material applications and manufacturing processes. The next-generation NSX will leverage its state-of-the-art hybrid supercar power unit, body and chassis to deliver exceptionally intuitive and immediate response to driver inputs. A “Human Support Cockpit” design concept inspired by the original NSX provides exceptional driver control, visibility and packaging, but is further advanced to meet the extreme performance expectations of a modern supercar. The NSX interior boasts exceptional forward visibility, simple and intuitive controls, and class-leading ergonomics. The NSX’s instrument cluster features a dynamic TFT display that responds to changes in the driver-selectable Integrated Dynamics System with pertinent graphics and information. Acura engineers coupled the company’s expertise both with high-performance engine and hybrid electric-drive technologies, with its two decades of experience with industry-leading dynamic torque-vectoring technologies, including Super-Handling All-Wheel Drive (SH-AWD), to create the most sophisticated, technologically advanced and intelligent powertrain in the supercar universe. The NSX has undergone extensive testing at some of the world’s most challenging race circuits, including the famed Nurburgring. The NSX features an “Advanced Sports Package” with placement of key powertrain components which gives the NSX, along with its lightweight body, the lowest center of gravity in its class. Handling is greatly enhanced by Sport Hybrid Super-Handling All Wheel Drive (Sport Hybrid SH-AWD), enabling lightning-quick response to all driver inputs—steering, braking and throttle—along with the stability, control and launch performance of all-wheel drive. The NSX’s dial-operated Integrated Dynamic System features Quiet, Sport, Sport+ and Track modes. The NSX also features a “launch” function to achieve the ultimate in “zero delay” launch performance, aided by both the engine and three electric motors. Acura will begin accepting custom orders for the new NSX starting in the summer, with customer deliveries expected later in the year. Speed-demons and supercar enthusiasts, your time has come indeed! It can’t be denied that these two models are raising the bar for 2015. Now that you’ve read and seen some of the highlights before these cars hit the market, what do you think? Share your feedback on the NSX or Titan with us on Facebook or Twitter. We’re happy to keep the conversation going about the latest car buzz!